Did you hear about the Mustang 5.0 Fever Sweepstakes? I was wandering around the the Ford Performance site, trying to figure out what it would cost to build myself a 2011 Cobra Jet Mustang and came across this new Mustang 5.0 Sweepstakes. Ford Customer Service Division is offering Mustang and Ford enthusiasts a chance to win the awesome 412 horsepower 2011 Ford Mustang GT in it's sweepstakes which began March 11,2010. That's not all. The winner, along with the grand prize Ford Mustang gets their 2011 Mustang GT equipped with some nifty Ford Performance parts and custom accessories. Here's the deal. Every time a Ford Funny car driver wins at a NHRA Full Throttle Drag Series event, a lucky fan wins a Ford Fan bonus prize, valued at $75. 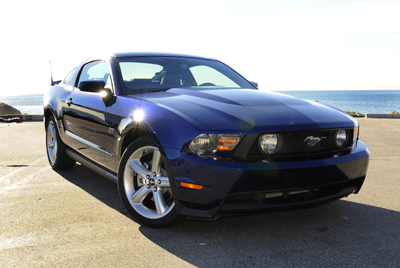 To be eligible for the bonus prizes and the grand prize 2011 Mustang, you'll need to know where to enter. The Mustang 5.0 fever promotion entries can be had at track events by finding the Motorcraft/Quick Lane Racing Experience display and finding the sweepstakes section. It's open to all U.S. citizens over the age of 18. Approximately 13 different venues will have the displays, but if you can't make it to one of them, you can still apply. Check out Ford's Parts site for more details. Contest closes on November 23rd, 2010. Still looking? Use search box below for more Mustang Pics.